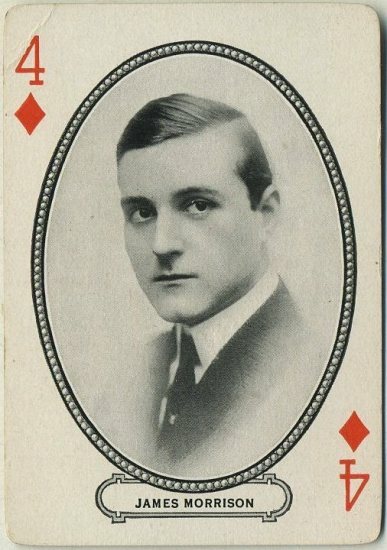 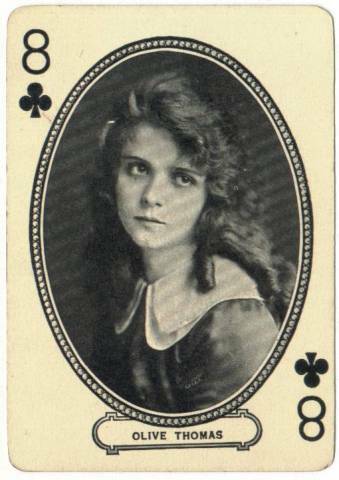 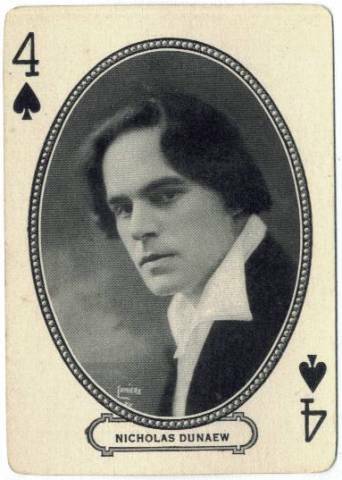 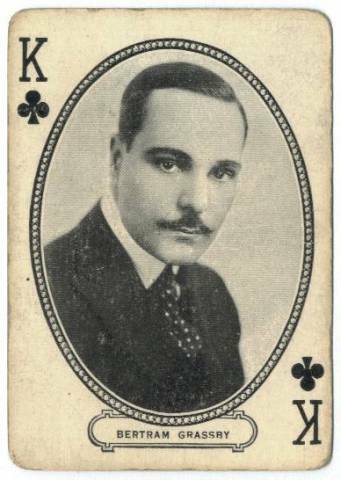 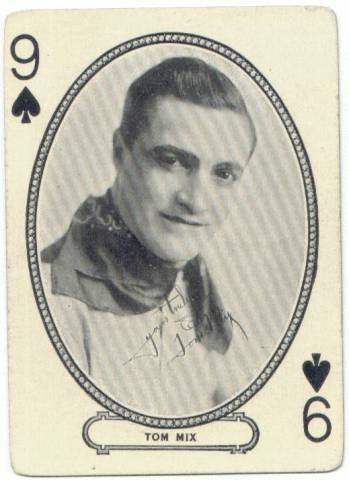 You are here: Home / Movie Collectibles / 1916 MJ Moriarty Playing Cards – Movie Souvenir Card Co. 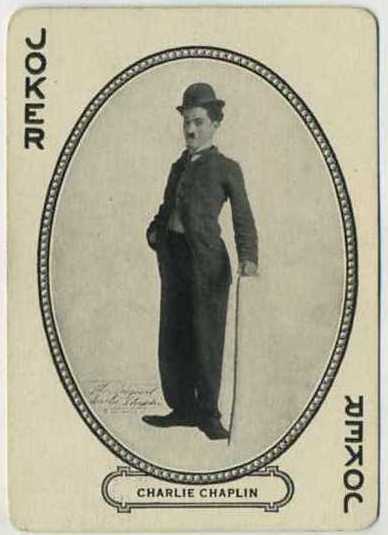 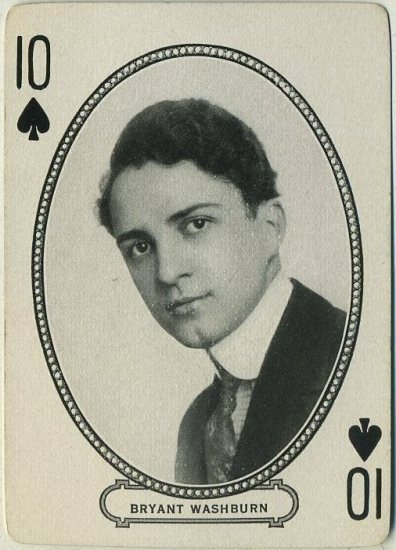 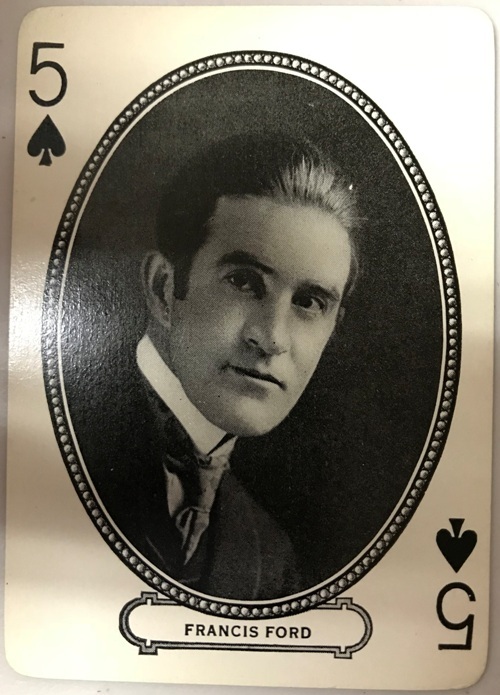 This deck of Movie Souvenir Playing Cards was issued with a different card of a period movie star for each number and suit, plus Charlie Chaplin fittingly as the Joker. 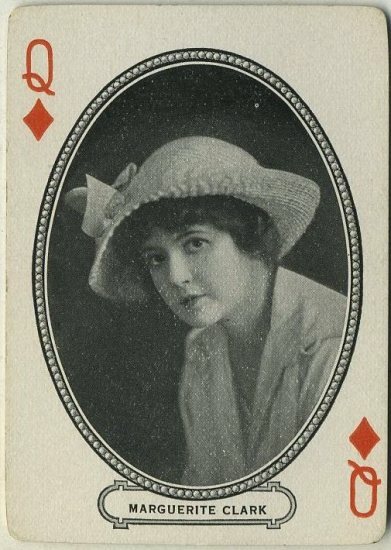 Several variations throughout as described below. 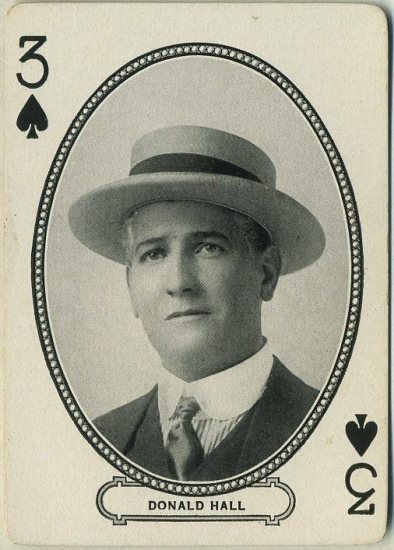 Issued out of Cincinnati in the USA. 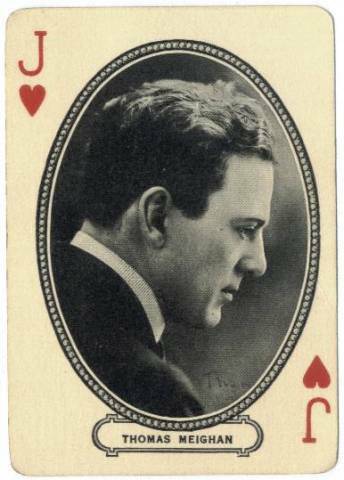 Each standard playing card measures 2-1/2" X 3-1/2 inches. 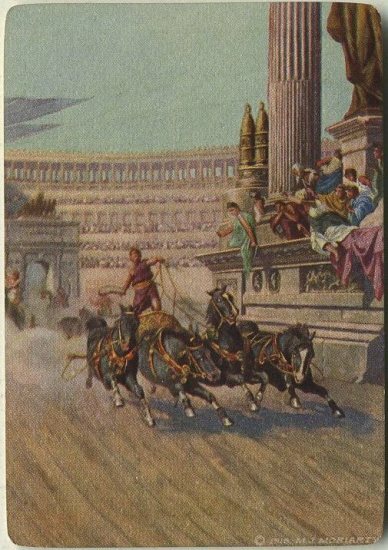 Same chariot scene on reverse of each card. 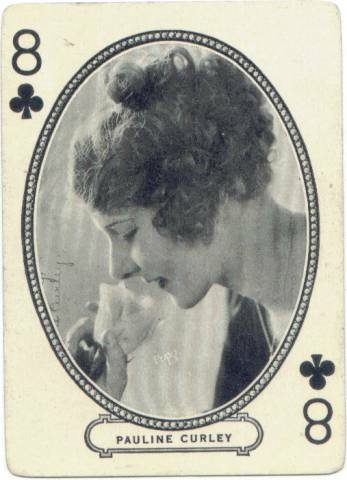 High grade examples maintain a gold gilt finish on the edges. 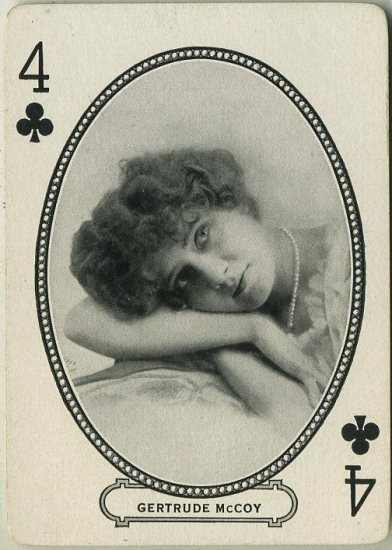 I usually buy these decks to split them up and make single cards available for collectors. 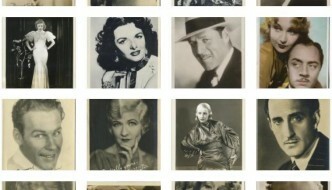 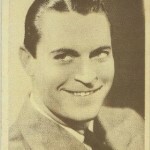 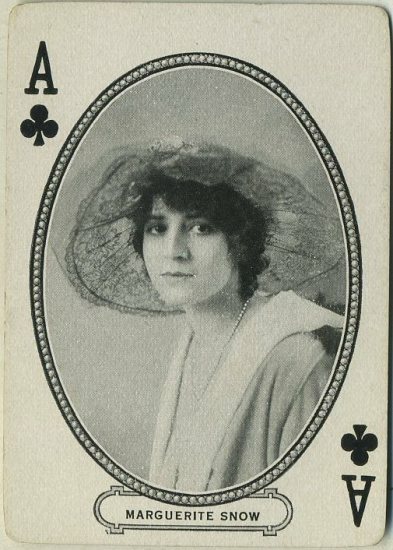 In the process of doing so I have found several different film stars represented in different decks. 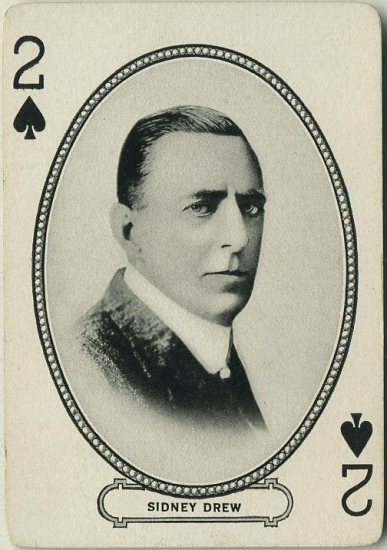 It is likely that the first version of the deck was in fact issued at the 1916 copyright date, while subsequent issues featured new cards over the next three or four years. 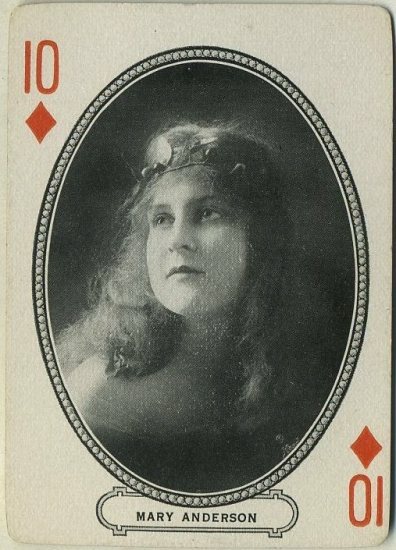 As of the last deck I have broken (#27), this 53 card set now realizes a total of 98 different stars and 114 different poses/cards altogether discovered in 8 different decks, some seemingly more common than others. 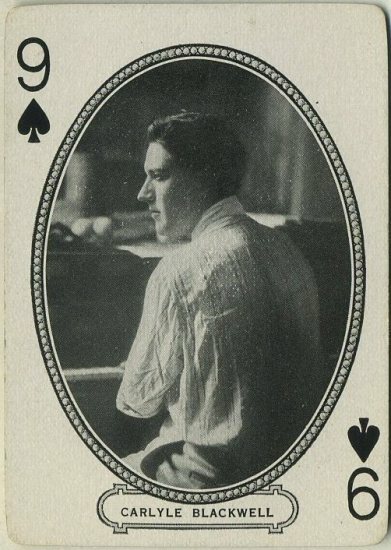 The backs of the Movie Souvenir Playing Cards are all the same and include a colorful chariot scene and the notation Copyright 1916 M.J. Moriarty. 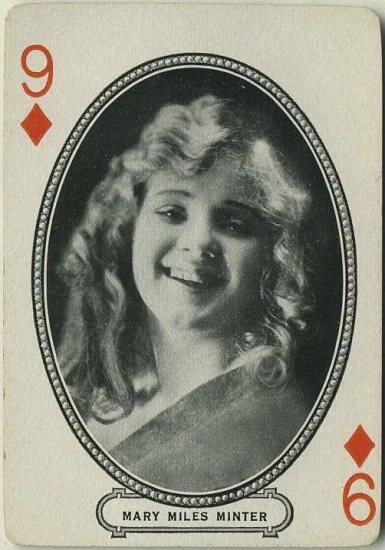 They were issued by The Movie Souvenir Card Co. of Cincinnati, Ohio. 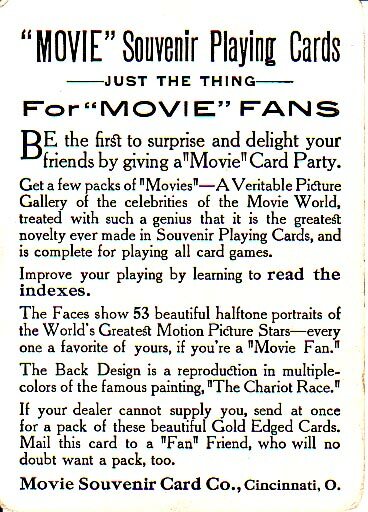 From the informational card found in the pack: "The Back Design is a reproduction in multiple-colors of the famous painting "The Chariot Race." 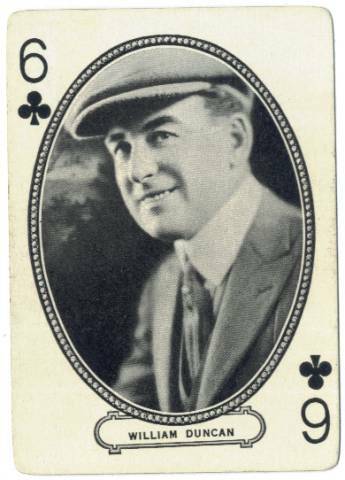 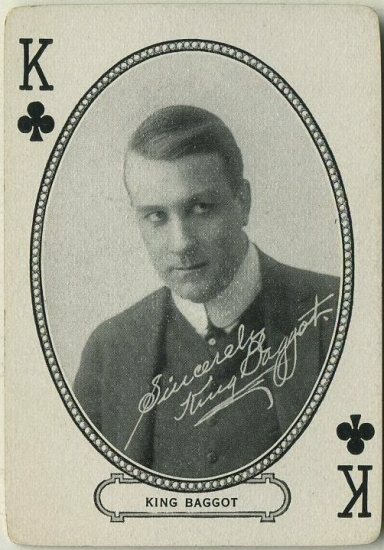 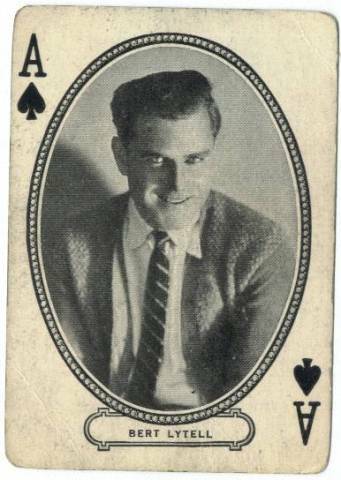 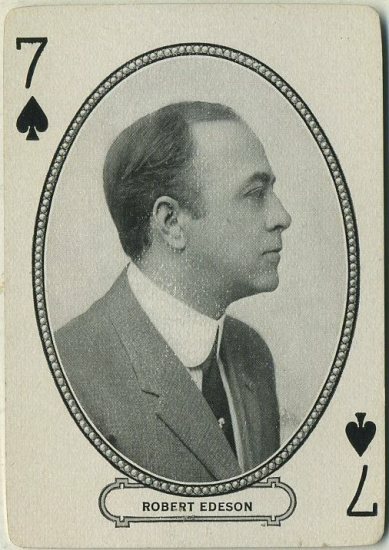 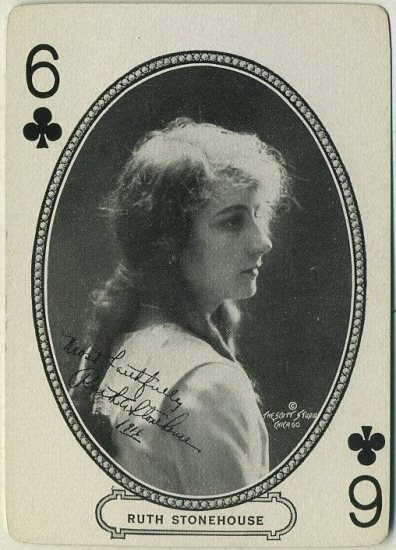 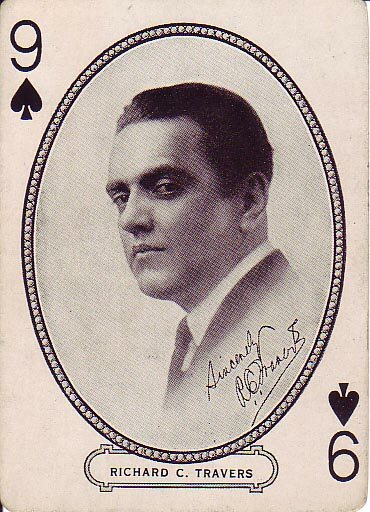 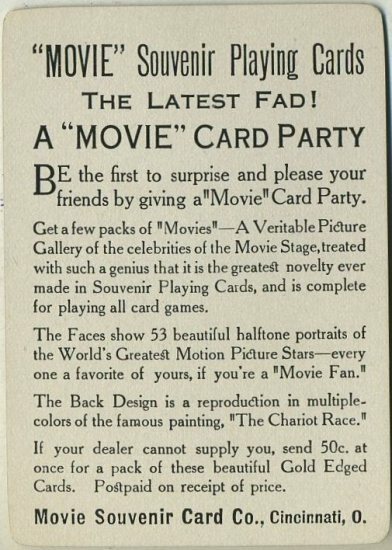 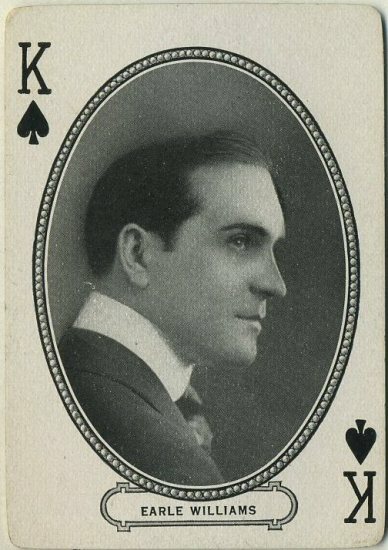 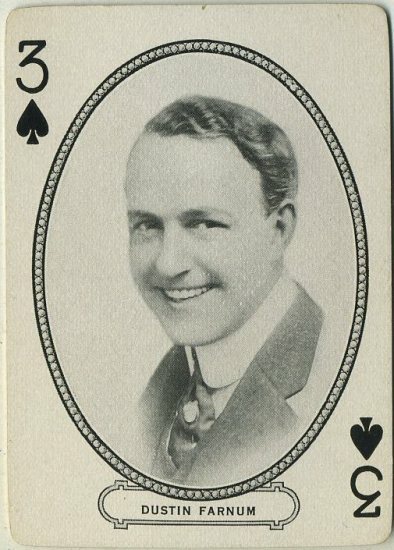 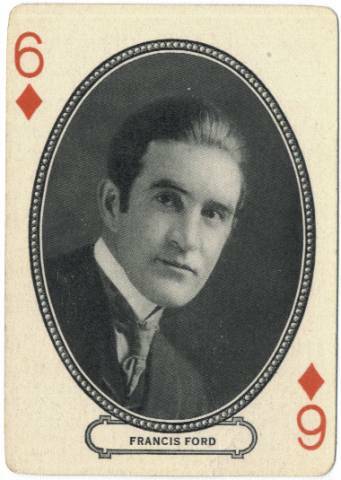 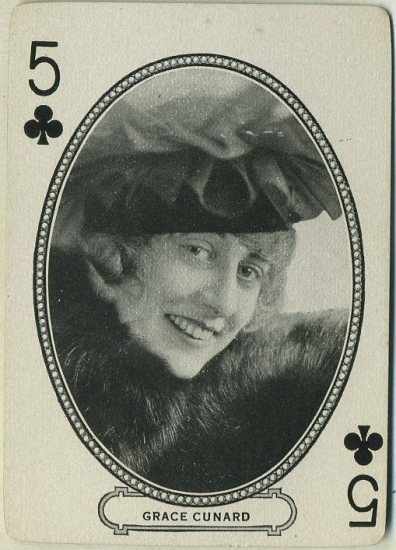 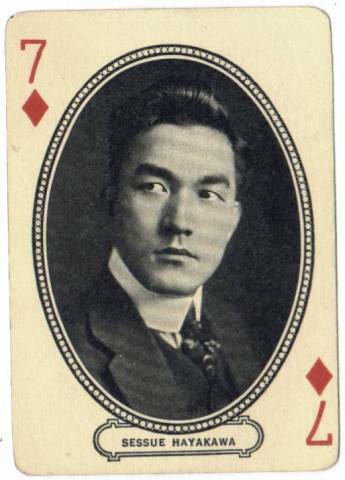 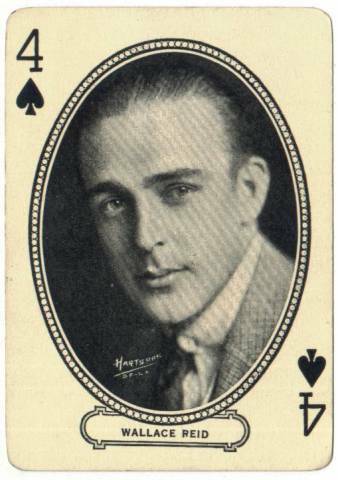 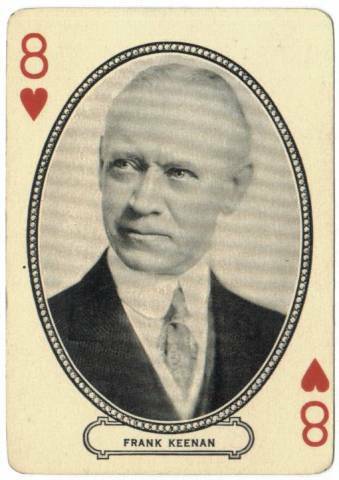 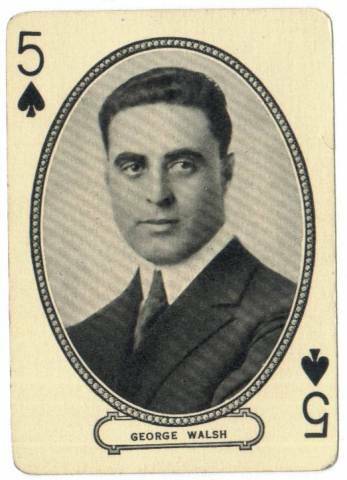 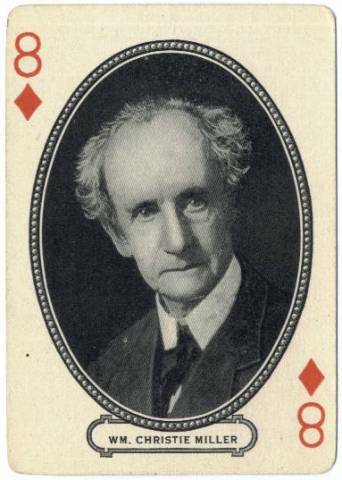 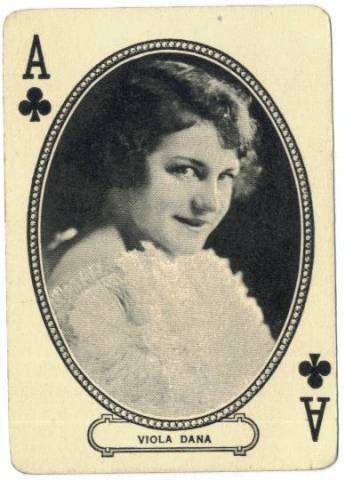 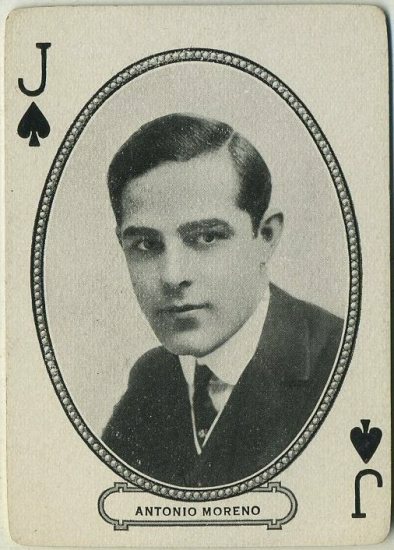 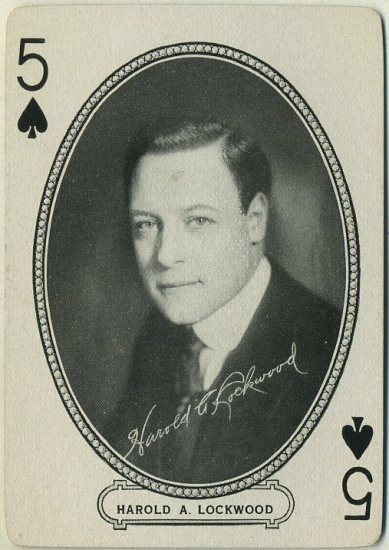 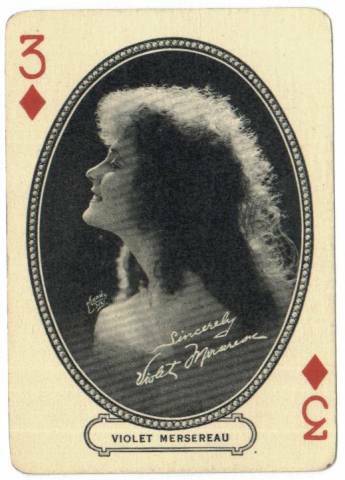 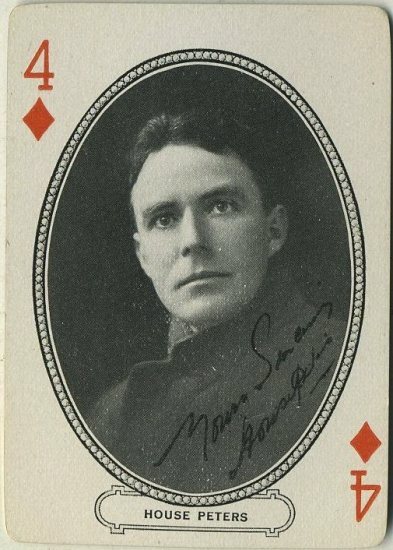 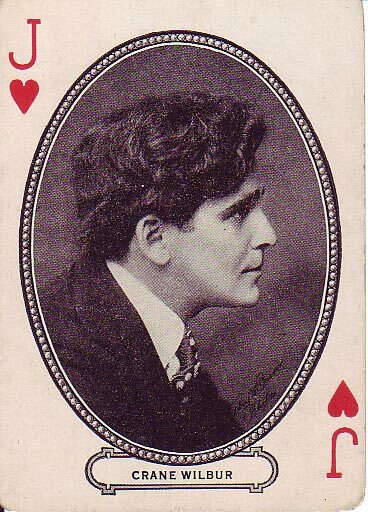 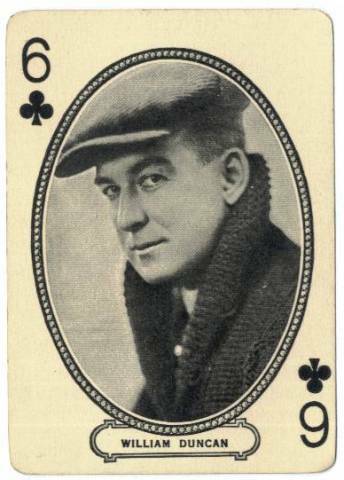 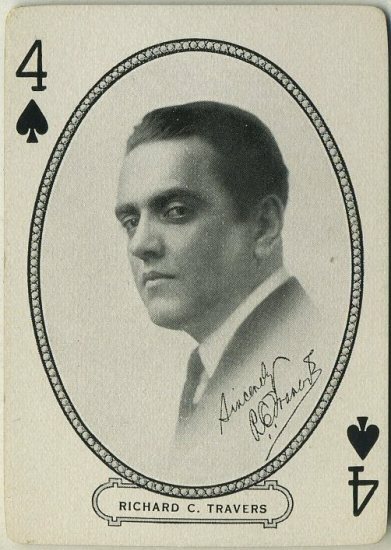 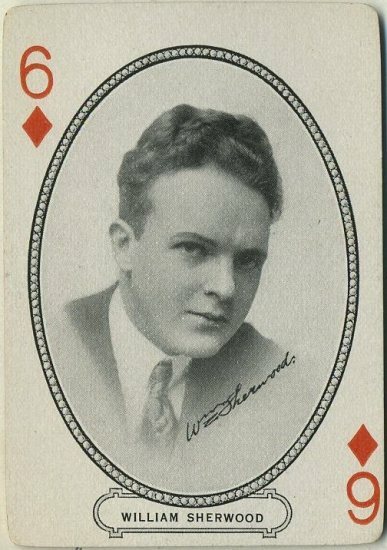 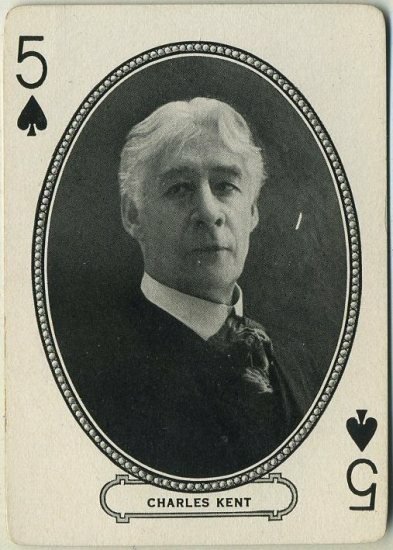 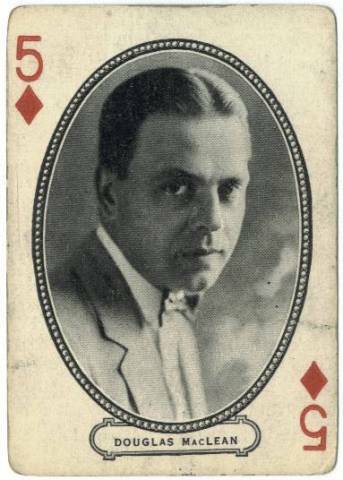 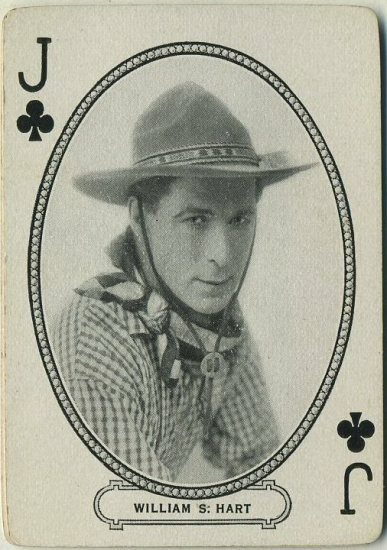 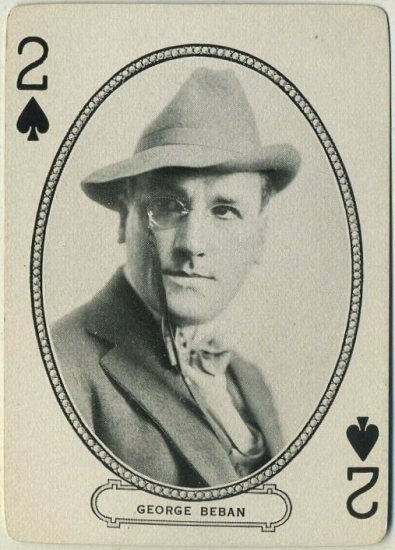 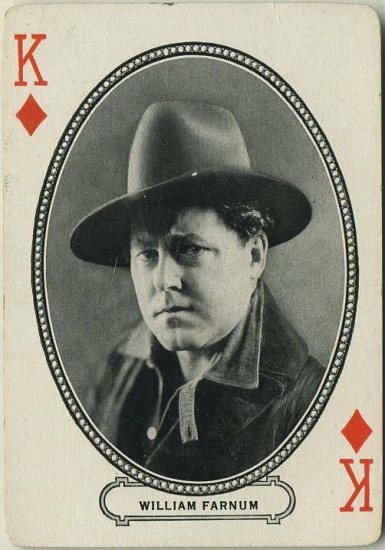 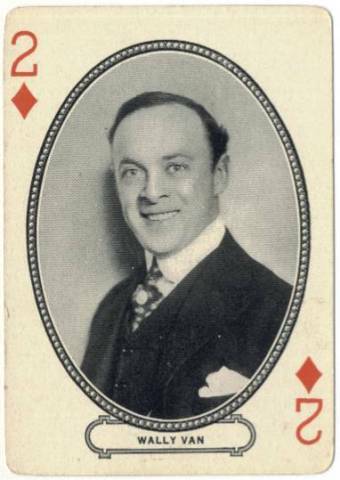 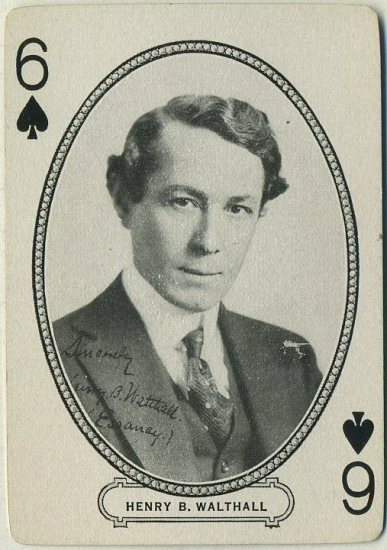 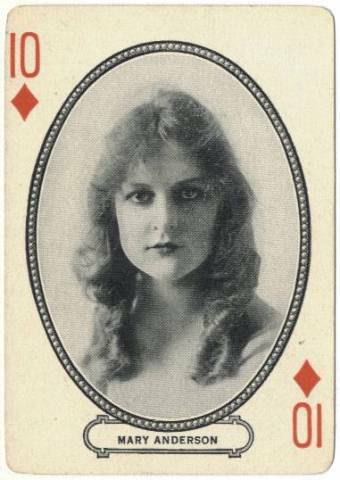 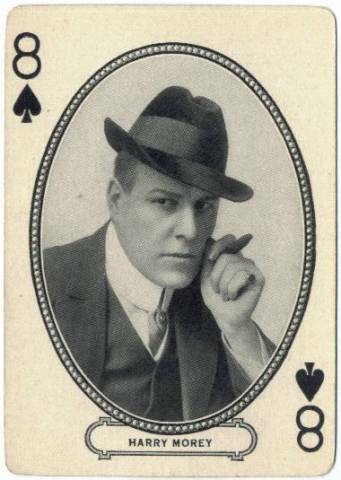 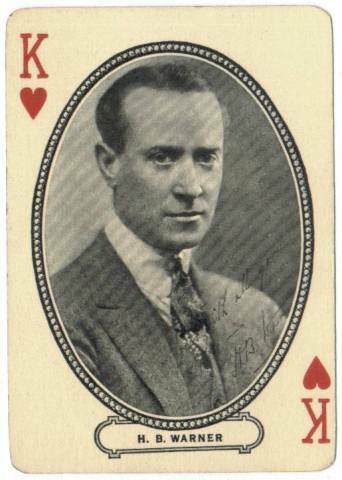 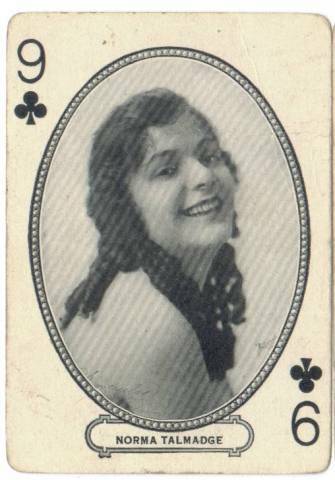 From the ad card contained: "Get a few packs of "Movies"--A Veritable Picture Gallery of the celebrities of the Movie World, treated with such a genius that it is the greatest novelty ever made in Souvenir Playing Cards, and is complete for playing all card games." 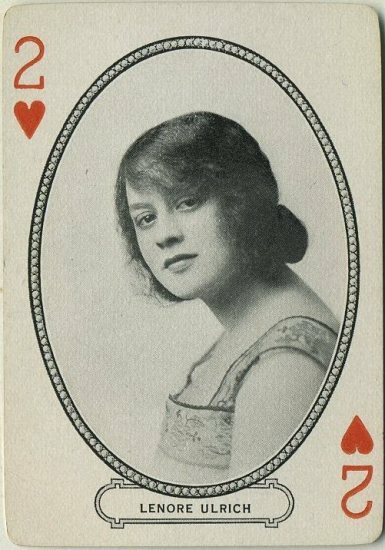 Following is a Gallery picturing each of 114 known cards. 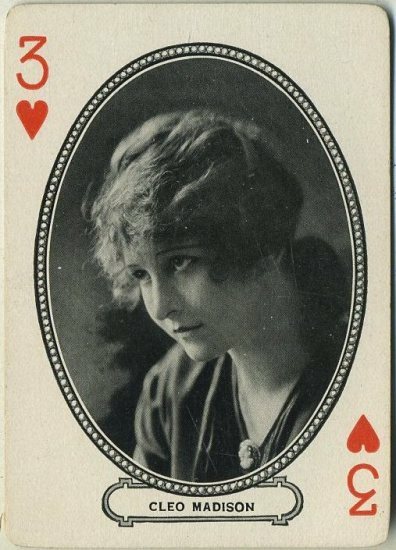 Below that is a text checklist naming those cards. 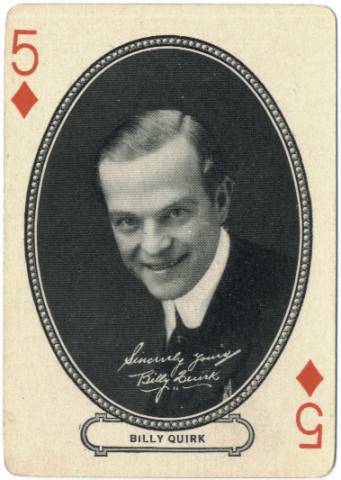 That is followed by some trivia about the decks and finally Immortal Ephemera Store listings of currently available cards. 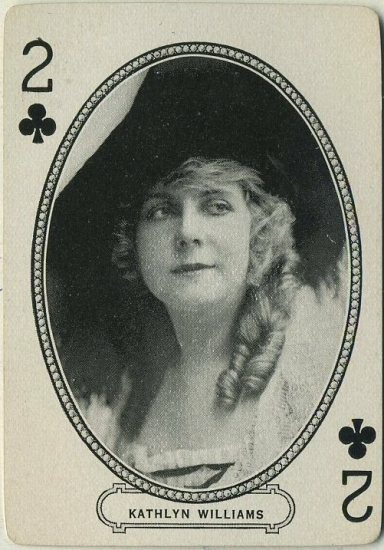 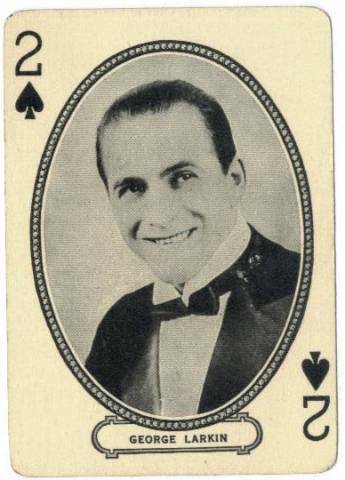 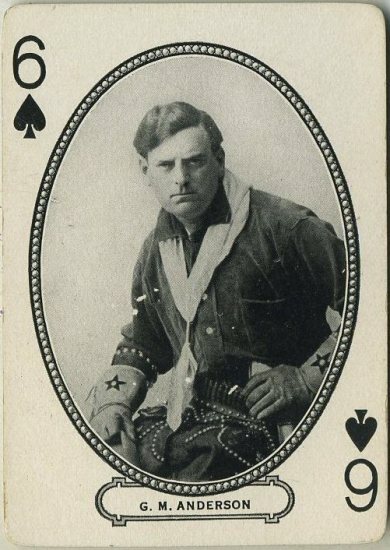 Just click on any image to open to full size and from there you can scroll through scans of all of the movie star playing cards that I have ever seen from various versions of this card deck. 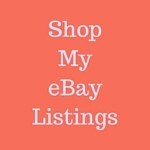 A checklist of all of the pictured cards follows the gallery with available sales listings below that. 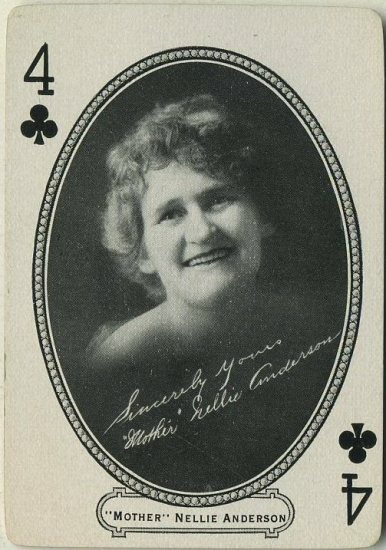 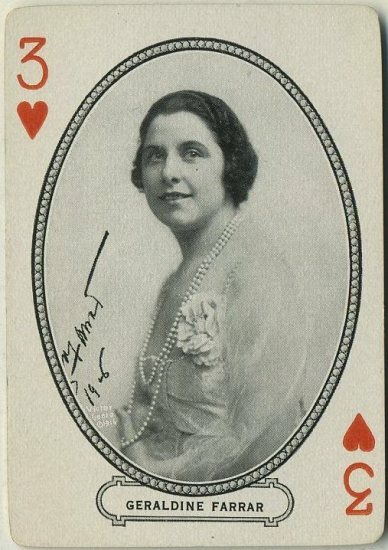 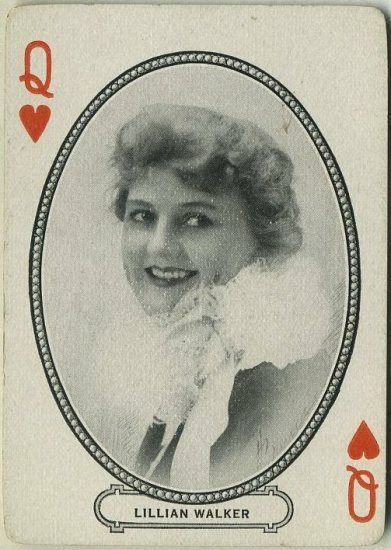 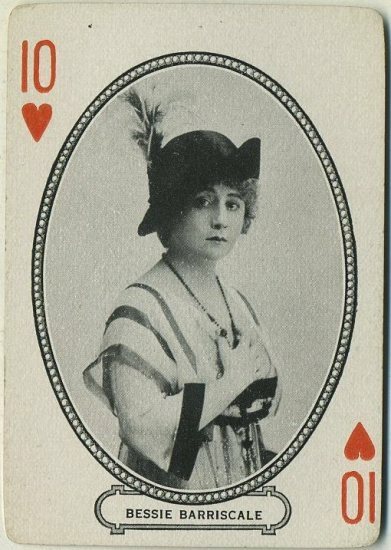 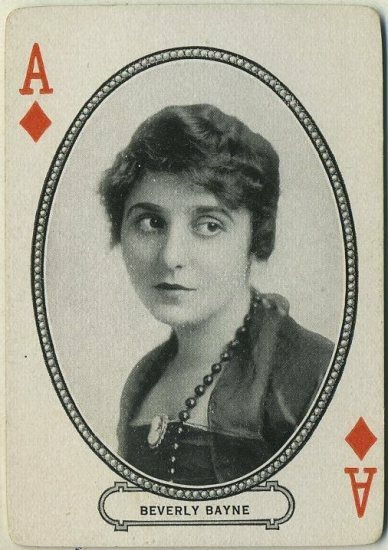 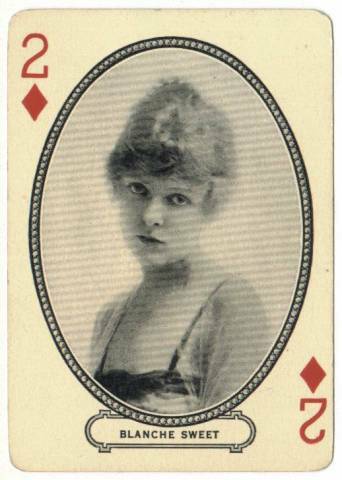 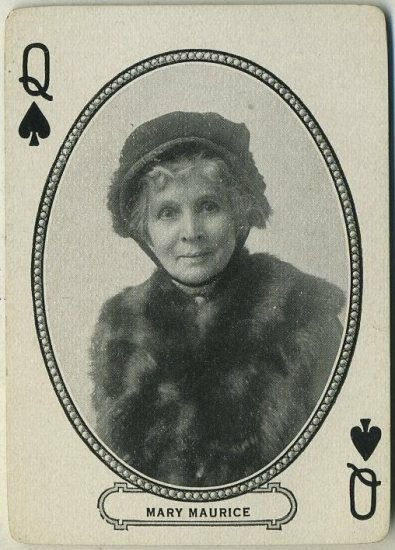 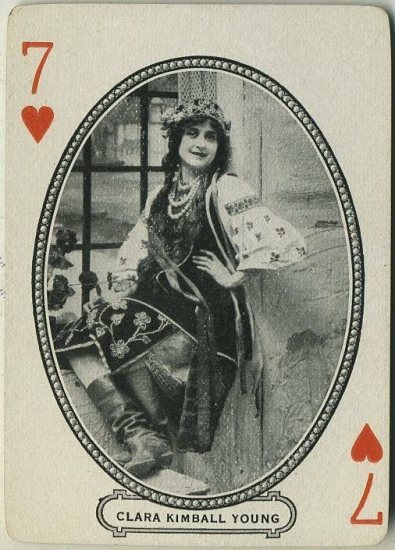 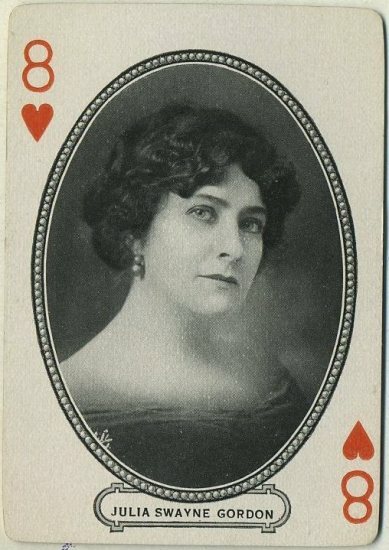 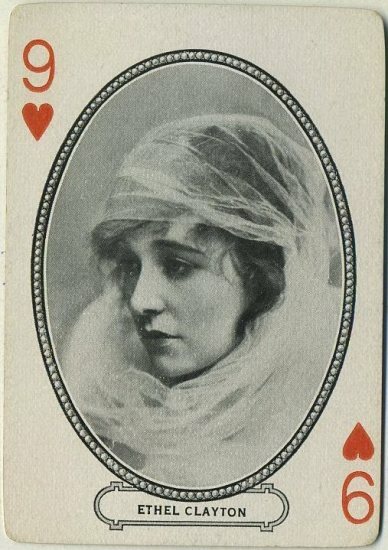 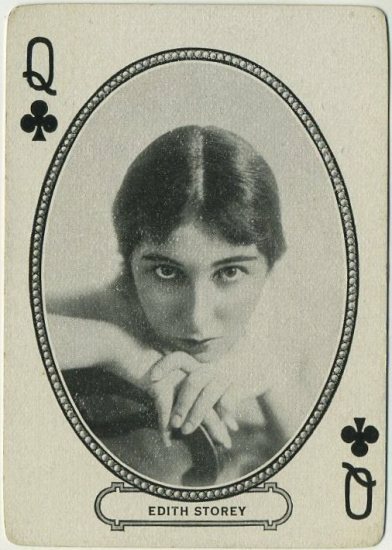 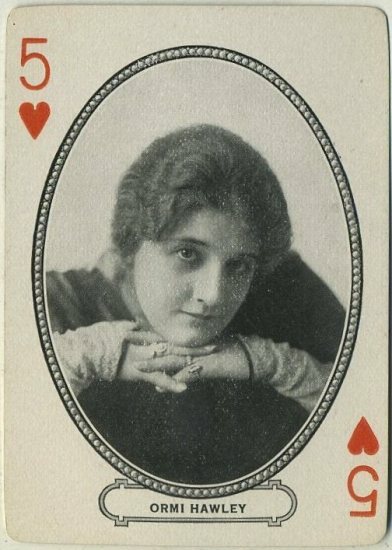 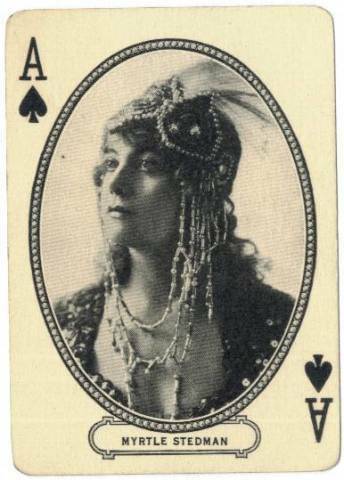 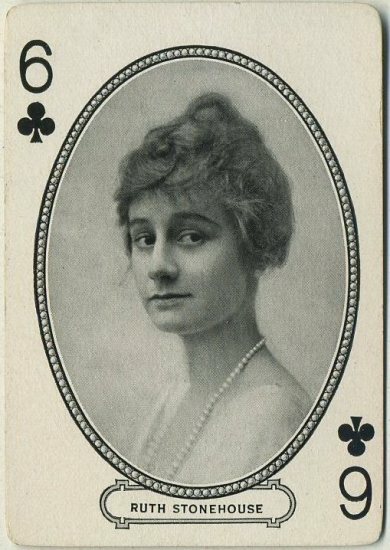 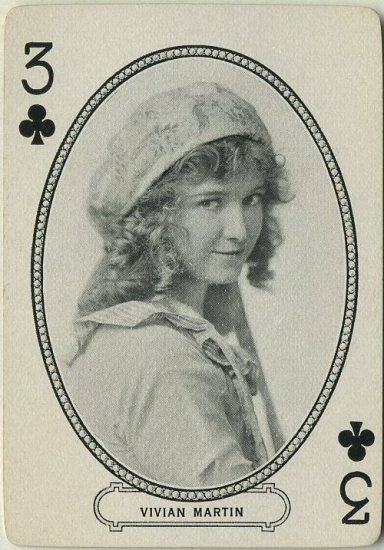 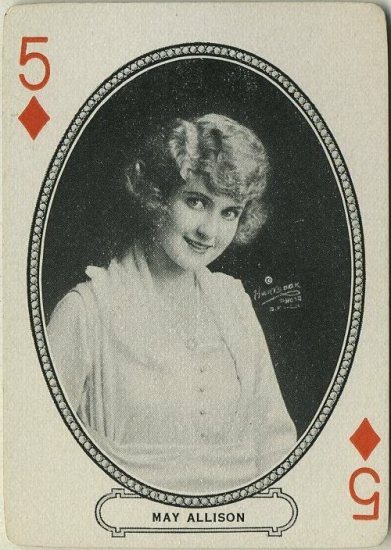 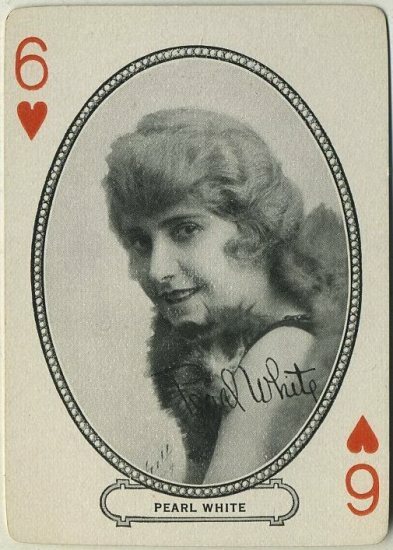 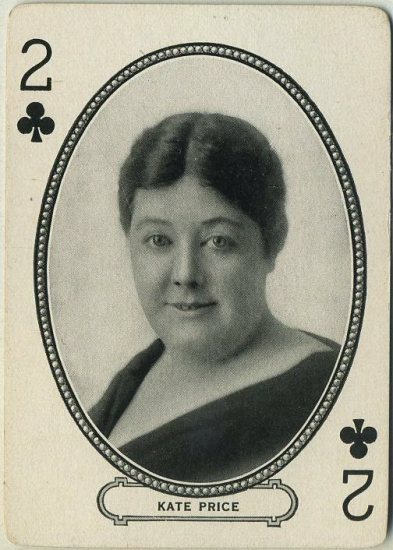 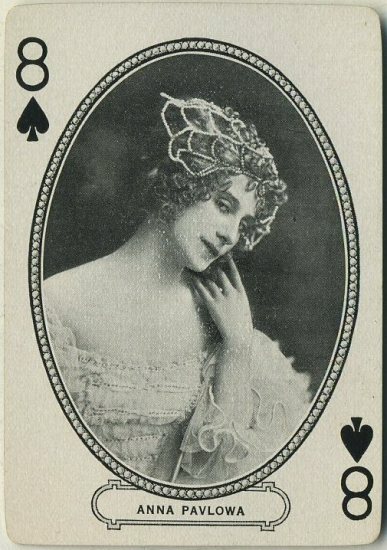 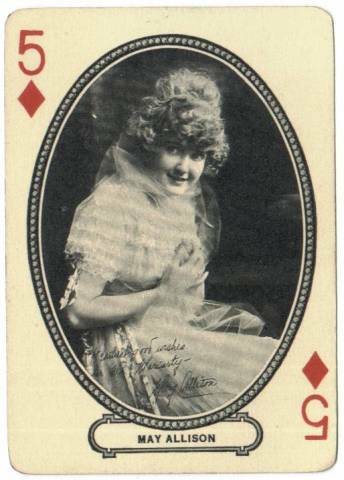 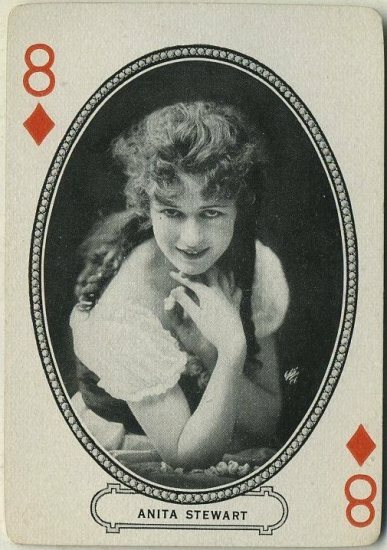 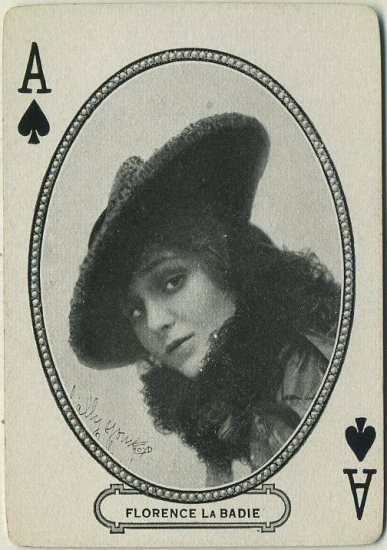 There are eight: Ruth Roland (4 different poses on the Ace of Hearts); May Allison (2 poses on the 5 of Diamonds); Ruth Stonehouse (2 poses on the 6 of Clubs); William Duncan (2 poses also on the 6 of Clubs); Clara Kimball Young (2 poses on the 7 of Hearts); Mary Anderson on the 10 of diamonds; Edith Storey (2 poses on the Queen of Clubs); and Marguerite Clark (2 poses on the Queen of Diamonds). 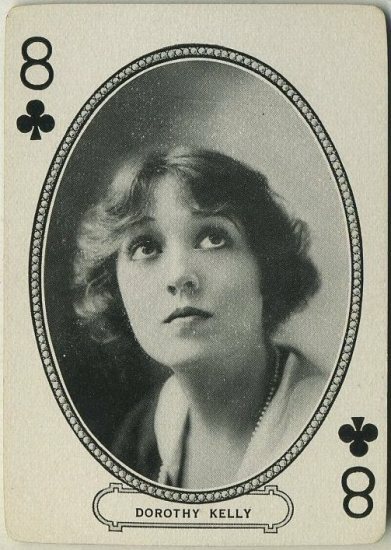 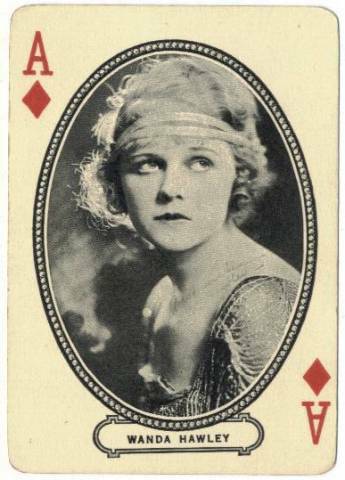 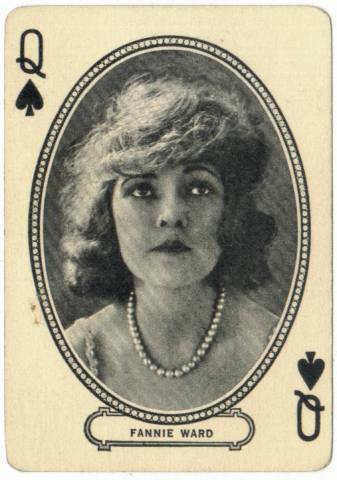 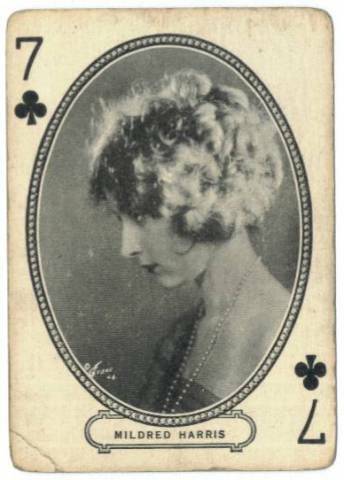 Technically you could add an eighth, as the 9 of Clubs sometimes features both Norma & Constance Talmadge while in other decks Norma has the 9 of Clubs to herself and Constance then appears separately on the 8 of Clubs. 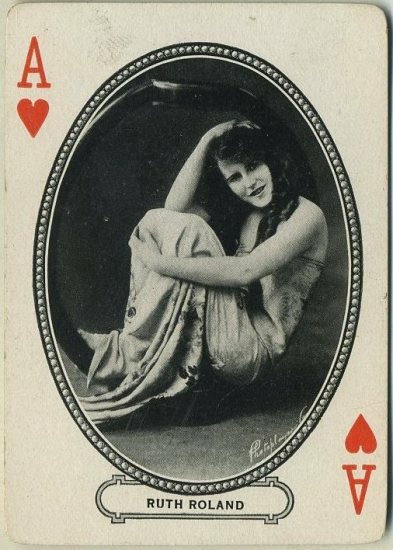 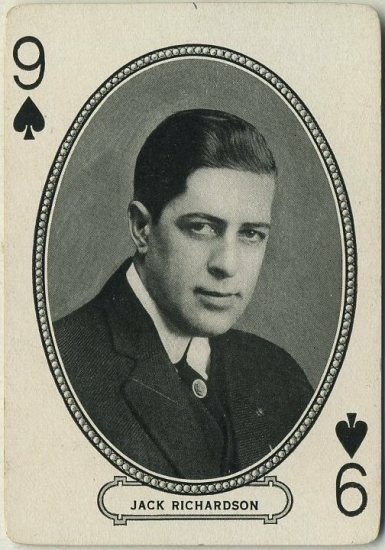 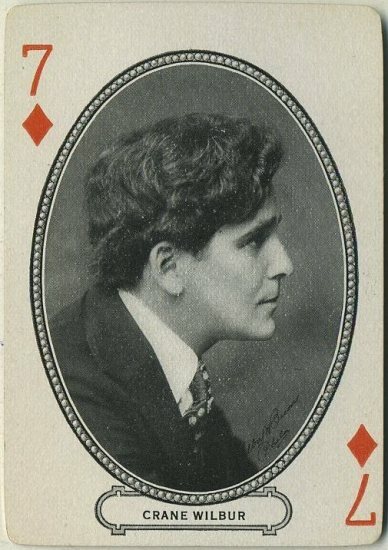 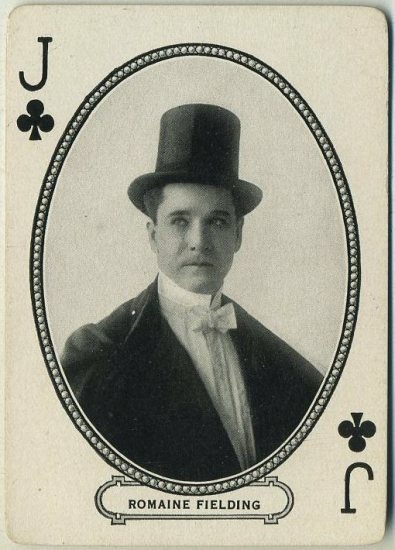 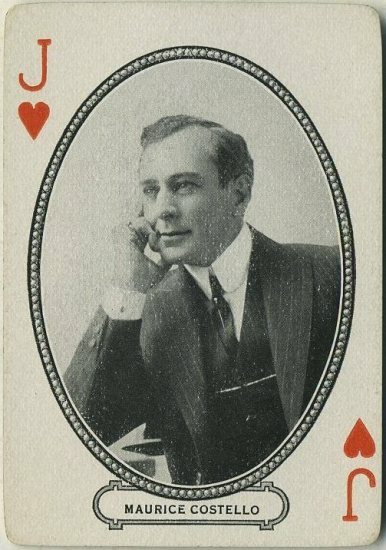 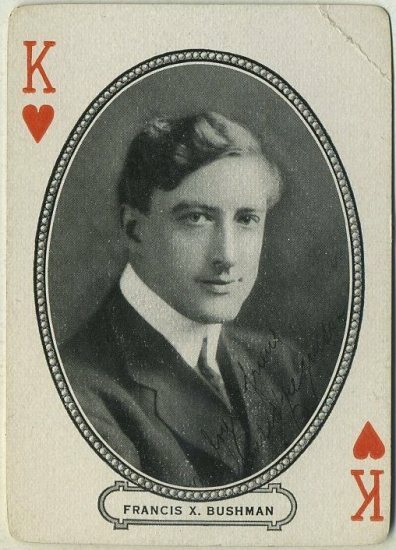 There are five: Francis Ford who appears on the 5 of Spades and 6 of Diamonds; Harry Morey who appears on the 6 of Diamonds and 8 of Spades; May Allison who appears on the 5 of Diamonds (2 poses as noted above) and the Queen of Hearts; Richard C. Travers on the 4 of Spades and the 9 of Spades; and Crane Wilbur on the 7 of Diamonds and the Jack of Hearts. 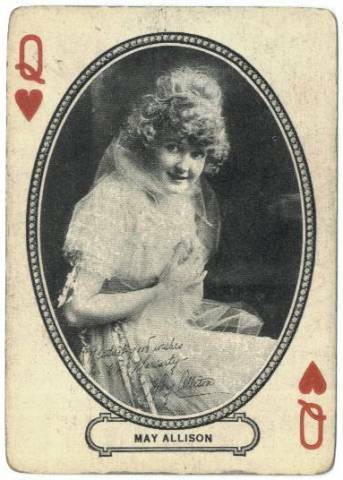 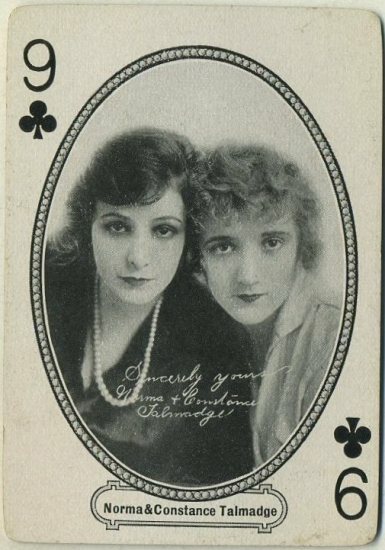 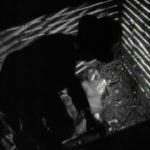 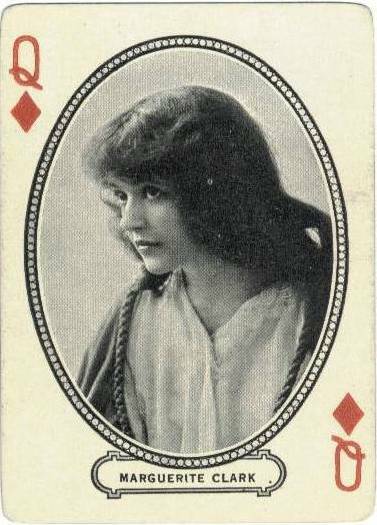 There are two: The 9 of Clubs has already been mentioned as featuring the Talmadge sisters, while child stars Dolores & Helen Costello are sometimes featured on the 2 of Hearts. 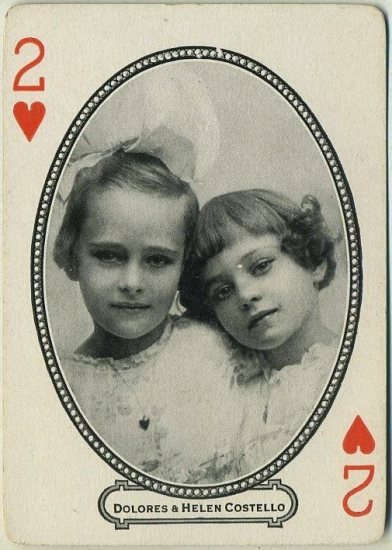 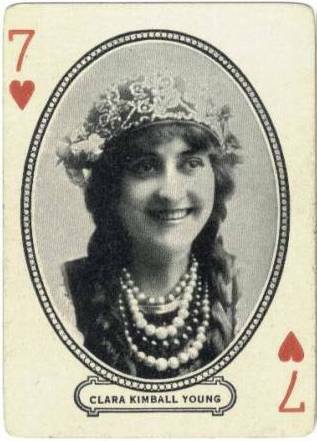 In these decks with the Costello sisters you will also find their father, Maurice Costello, on the Jack of Hearts. 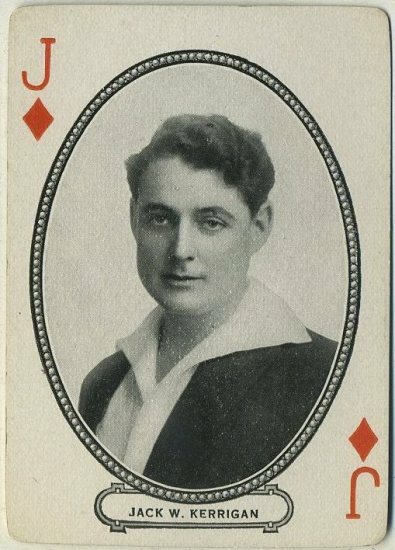 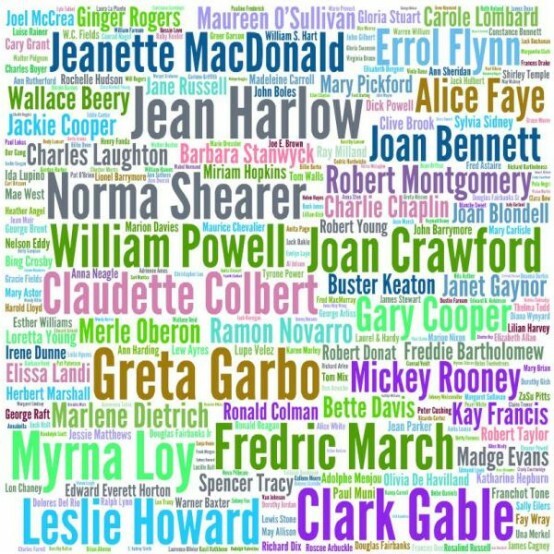 An interesting aside, when Dolores grows up she marries legendary John Barrymore (who has yet to turn up in any decks!) 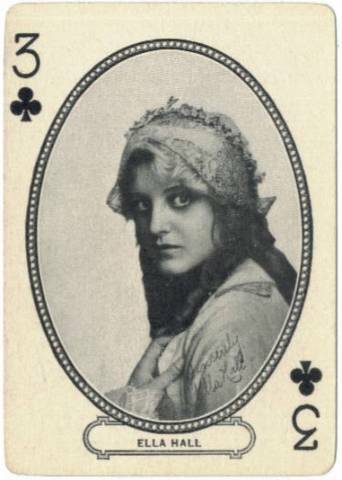 and is actually the grandmother of current star, Drew Barrymore. 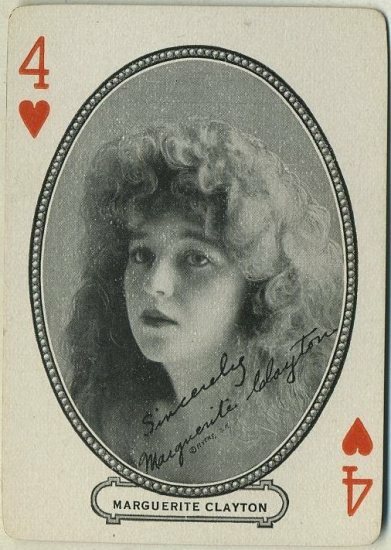 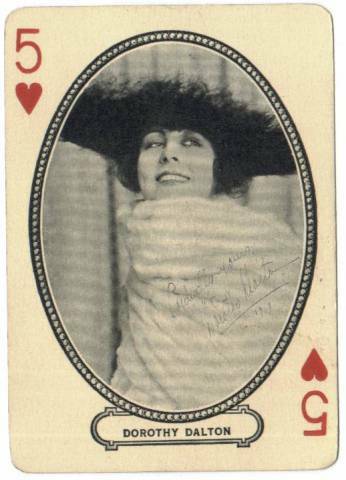 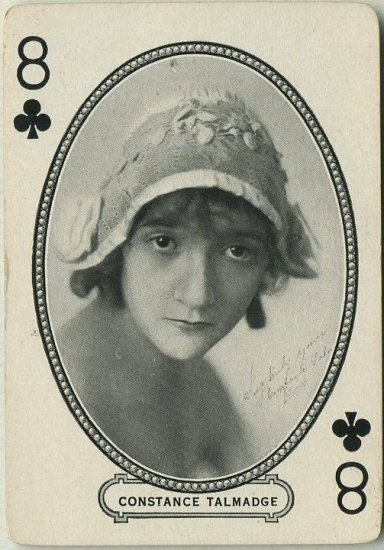 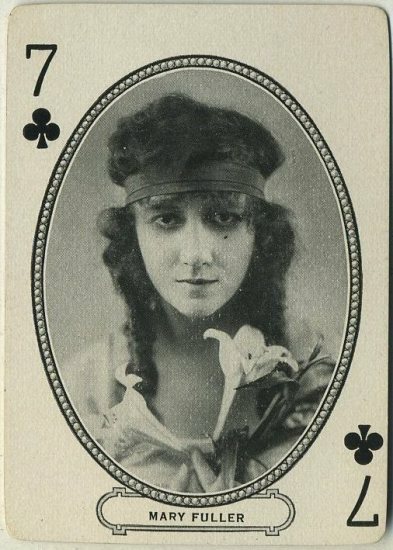 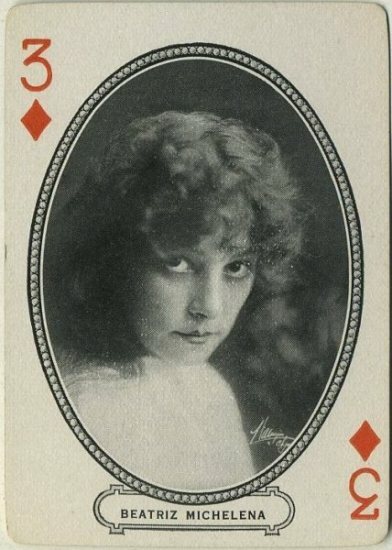 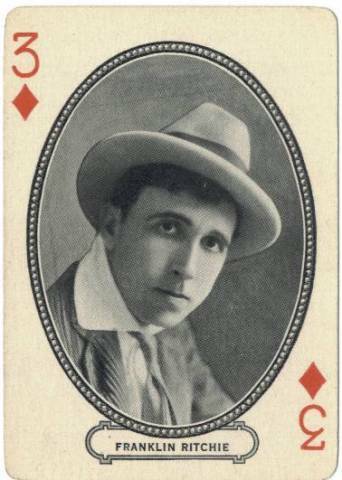 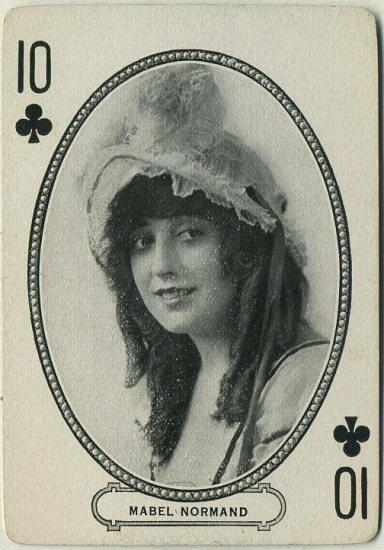 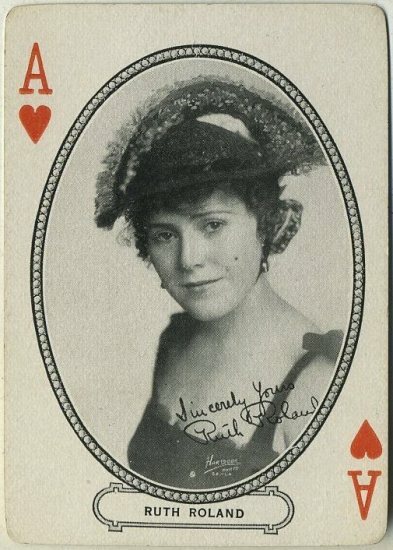 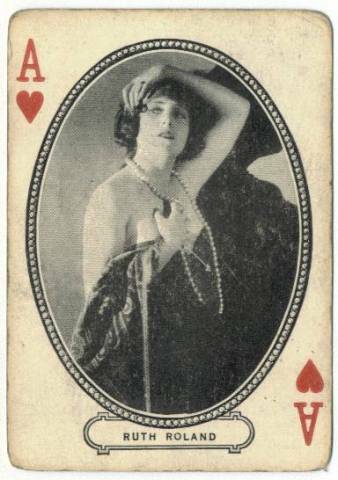 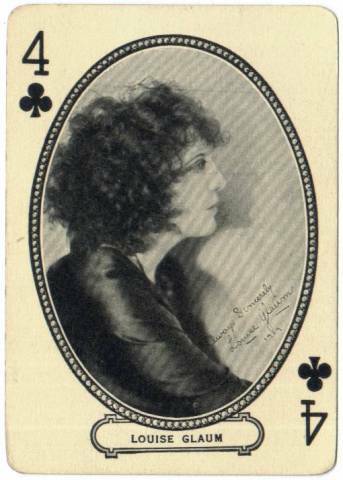 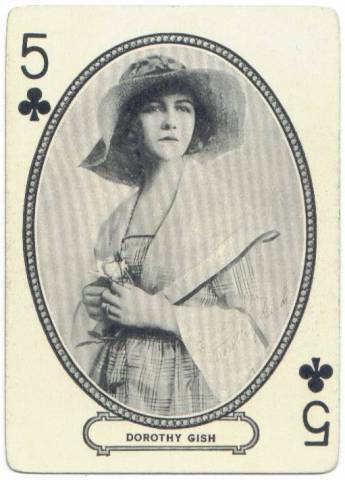 There are 13: Marguerite Clayton on the 4 of Hearts, Pearl White on the 6 of Hearts, Robert Edeson on the 7 of Spades, Ethel Clayton on the 9 of Hearts, Mary Miles Minter on the 9 of Diamonds, Bessie Barriscale on the 10 of Hearts, Mabel Normand on the 10 of Clubs, Bryant Washburn on the 10 of Spades, Jack W. Kerrigan on the Jack of Diamonds, Antonio Moreno on the Jack of Spades, William Farnum on the King of Diamonds, Earle Williams on the King of Spades, Charlie Chaplin on the Joker. 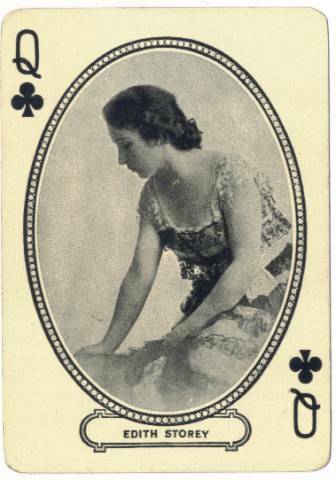 Also noteworthy is that four of the five stars who appear in multiple poses on the same cards are also the only stars featured on those cards: Clara Kimball Young, Edith Storey, Marguerite Clark, and Ruth Roland. 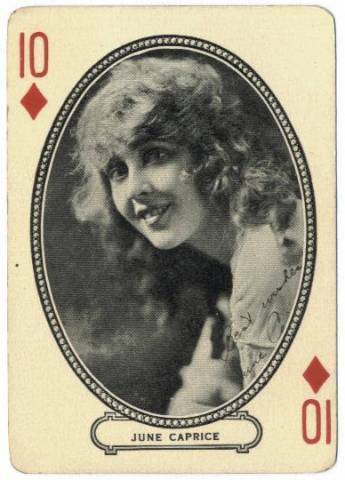 One would think these 13 universal cards would be worth less compared to others, but for understandable reasons Charlie Chaplin and Mary Miles Minter carry substantial premiums in value, while even Mabel Normand and Pearl White sell for more than an average card.